On Thursday 8 October 1914, only a month into the First World War, a reporter from the Exeter and Plymouth Gazette saw a disembarkation that was to be repeated countless times in the next four years. Soon after 4 o’clock in the afternoon he saw ‘a couple of carriages’ and ‘some 25’ motor cars lent by Exeter residents ‘drawn up outside the entrance to ... Queen-Street [now Exeter Central] Station’ and the ‘special carriages attached to the express train’ that had just arrived. People were not allowed on the platform, but ‘huge crowds lined the vicinity of the station and the route’ as the cars and carriages hauled the ambulance trailers to one of the city’s War Hospitals; in 1917, the nurses meeting the trains would see a long file of gas-blinded men, each holding the clothes of the man in front, stumbling towards their transport. 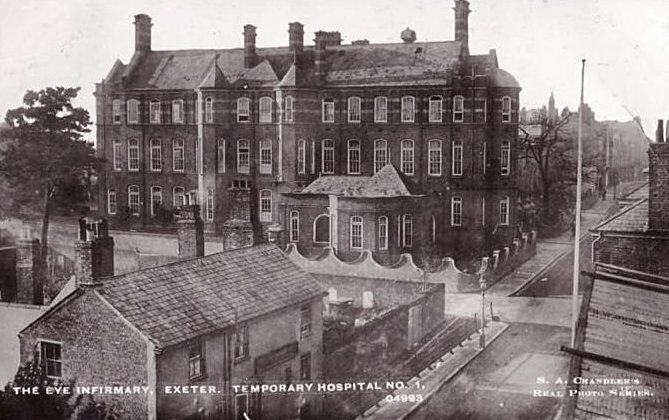 35,000 such war wounded from Flanders and France passed through Exeter’s Red Cross five (eventually eight) Temporary War Hospitals, receiving surgery, treatment and rehabilitation; what had begun as a Devon Red Cross Voluntary Aid Detachment (VAD) initiative became after 1916 an arm of the military campaign, under the 4th Southern General Hospital, Devonport. Episcopal Modern School for Girls (No. 2), Workhouse Children’s Home (No. 3), Topsham Barracks (No. 4) and Bradninch Hall (No. 5). To back up the medical effort, the people of the city made cakes, grew fruit and vegetables, sewed clothing and prepared packs of wound dressings. Children gathered sphagnum moss from the marshland beside the river Exe, or helped make that foraged on Dartmoor into dressings that could absorb fluid from a wound and protect it from flies or other airborne infection, a surgical treatment officially approved by the War Office in 1916. Among the qualified nurses on the wards, originally at the Eye Infirmary and later at the Episcopal Modern School in Pennsylvania Road, was ‘Sister Vlieland’ – Dorothy, second daughter of Alice Edith and Charles James and younger sister of Frances Maude, who had qualified around 1907 (probably at the Royal Devon and Exeter Hospital across the road from 20 Southernhay West, at that time still the family home) and volunteered to serve in 1914. War Hospital No. 2 treated patients with bomb and gunshot wounds, so saw many sepsis cases, caused when an open wound sustained on the battlefield became infected and, left untreated, caused bacteria to leach into the bloodstream. Apart from battlefield injuries or neurasthenia (shell-shock), many soldiers would also have been suffering from phthisis (pulmonary tuberculosis or TB), rampant in the slum housing in which many of the soldiers had grown up; after 1917, recruits were screened for the disease on enlistment, but before the advent of x-rays many cases were missed, and in cold and wet battlefield conditions, exhaustion from unceasing fighting and often poor food, a primary infection could quickly become a secondary and fatal one. Conditions at the front – mud, rats and, in theatres such as Egypt and Greece, insect bites such as the one that caused the poet Rupert Brooke’s death in April 1915 – were all inimical to efforts to improve hygiene and sanitation. Wound-cleaning agents such as carbolic or saline dressings, or the mixture of sodium hydrochlorate and boric acid known as Carrel-Dakin’s solution, could be of only limited use in the days before antibiotics. London chemist, Henry Dakin, and three doctors – Harry Platts and Frederick Escritt, who both survived the war, and Alfred Gould, a South Devon doctor from Holne, who was killed in France in May 1918 – were among those who experimented with ways to limit the transmission of disease, but most of it bore real fruit only after the war. The Exeter hospitals were among the first to routinely use Carrel-Dakin’s solution, and their stress on hygiene mirrored that of Alice Edith in her paediatric work in Heavitree. Dorothy died at home on 17 June 1917; we do not know how she died, but an infection contracted from one of those she was trying to heal seems the most likely cause. As Temporary Hospital No. 2 was in the parish of St David’s Church, Dorothy has her place on the Roll of Honour there. Particular thanks are due to Julia Neville (j.f.neville@btinternet.com) and the Exeter War Hospitals Research Group; also to the Exeter and Plymouth Gazette, Exeter Memories and Legendary Dartmoor (www.legendarydartmoor.co.uk) for some of the material in this post,and to Barbara ! So far we have no picture of Dorothy Vlieland. It could well be her on the picture of the opening of the Rougemond garden standing behind Nicholas Vlieland.